CowManager, the leading cow monitoring company, announces the introduction of Fertility Insights and sets next steps towards a big data platform. Its new data integration capabilities accelerate cow fertility insights and have been designed to collect, manage and process the enormous amount of data being created 24/7 about a cow’s fertility status. With the average herd size increasing, producers are facing more and more challenges in detecting cows in heat and finding sick cows. Accurate information about cow health is essential to success in dairy farming. CowManager monitors the cows’ condition with great precision, to enable producers to give their cows the attention they need. To be able to provide producers with the most accurate information about a cow’s fertility status, CowManager has created a smart algorithm, which continuously combines fertility data from CowManager and various management systems that are available worldwide. The data from CowManager’s ear sensors are combined with cow events and alert intervals into a new set of alerts in the CowManager system named, Fertility Insights. The data is synced continuously and can be configured specifically for every business. 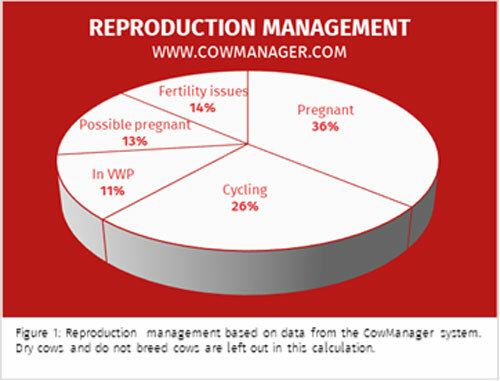 Combining cow data gives clear answers about the fertility status of a cow; is she cycling or cystic? What is her heat interval? Was the insemination successful? Is she still pregnant or has she aborted? Is her uterus clean after calving? All this data can be downloaded in reports, which are easy to use for reproductive management and vet checks. A quick overview of all cow data enables producers to make faster and more balanced decisions. It will support producers in selecting for insemination, minimize pregnancy checks and stress, and save management time. The pie chart in figure 1 is based on lactating cows only. The combination of heat detection with Fertility Insights provides producers a total overview of their herd’s repro status. For example, the 14% fertility issues are being picked up and based on a couple of Fertility Insight statuses. It shows that CowManager basically detects every cow’s fertility status; even when a cow is not coming in heat or when she aborted. CowManager develops and produces innovative cow-monitoring solutions to improve productivity and profitability of the modern dairy farm. Thousands of producers in over 30 countries rely on CowManager’s easy-to-install, user-friendly ear sensor system for an accurate understanding of their cows’ fertility, health and nutrition status. CowManager has revolutionized the world of cow management systems with groundbreaking innovations and has invented the active ear tag technology, based on generations of knowledge, science and the drive to improve every day. CowManager is available all over the world, distributed and supported by a growing number of dealers.